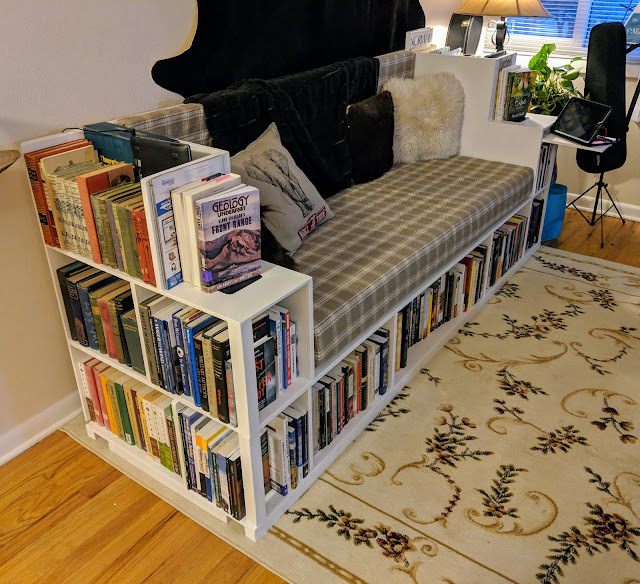 We needed more room for our books and the shelves just weren't cutting it. I found great ideas on Pintrest like this TARDIS-inspired bookshelf and this single-seat bibliochaise. In the case of the latter, it links to a great Instructables site that shows you almost everything you need to know to build it, even though the plans aren't free. 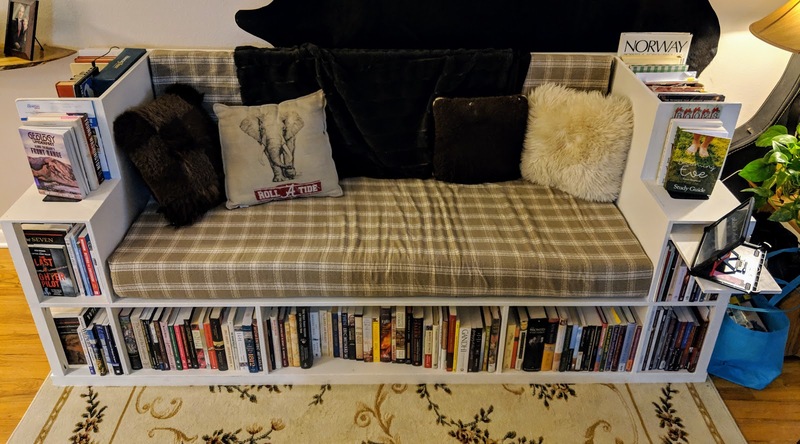 But it still didn't meet my desires of having a comfortable bench to lounge on with my wife and hold our books. Fortunately, I'm a pretty amazing guy.... and humble. Right away I went to work with math and paper and pencils and erasers and more math... What I concocted was the perfect fit! A Bookshelf-Lounger!!! I felt like Frankenstein when he created his monster, no analogy, just the monster. Anyway, the final dimensions of this beast are 29" deep, 36" high, 90" wide. I crafted this in my driveway and my wife helped me tote it through the front door. If you are to attempt this build, measure your doorway several times to make sure it will fit when you're done. It would be a bummer to make this and not be able to fit it in the house. The plans are linked from my Drive. Please let me know what worked/didn't work for you. I'd love to see your finished product!